For my daughter’s sixth birthday, I asked family to give her a gift of their time. Most people weren’t sure what to do with this information. But my daughter’s grandparents stepped up to the plate. 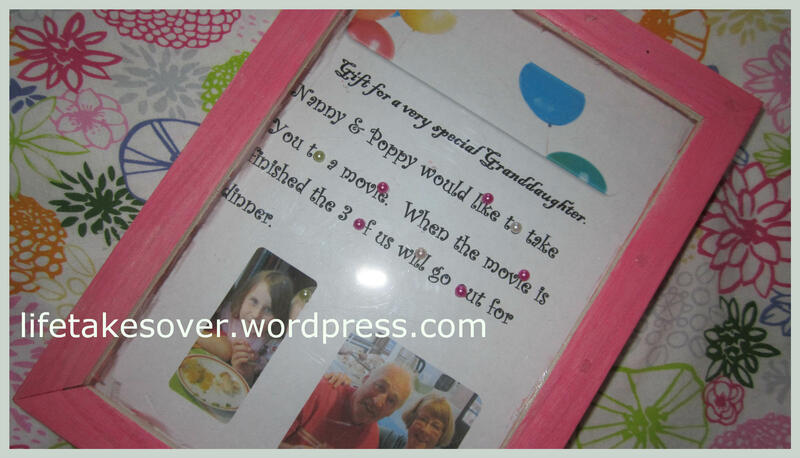 They provided a beautiful, personally decorated shadow box that contained an invitation to my daughter for a movie and dinner date with her grandparents. She received many other wonderful gifts that day, but this is the gift she is still talking about. The movie and dinner date hasn’t happened yet. A date was set for a PD day in January, but my daughter talks about it all the time and can’t wait to go to the movies and to dinner with her grandparents. And after they have done that, she will still be talking about it I’m sure. And this will stay with her way more than any toy or article of clothing she has received from her grandparents. Shiny toys, the latest gadgets and an abundance of “stuff” will make up children’s wish lists this holiday season. It is no wonder that the billion-dollar toy industry is thriving. However, studies have shown that having too many toys can have a negative effect on children. Without as many material items, children are forced to interact with others and use their imagination to invent games. A study in Germany found that social interaction in childhood leads to a range of skills including problem solving. Childhood experts agree that academic success and positive social interactions in adulthood are attributed to childhood friendships. Studies have shown that children, who spend quality family time before the age of 12, are greater achievers later in life and develop fewer behavioural problems. Family time has proven to be more effective in the development of a child’s performance and social abilities than school time and studying. • A trip to local attractions like the zoo, aquarium, museum or science centre. • A gift certificate or contribution to music lessons or a class like cooking, pottery or acting. Dr. Walter Heidary, dentist by practice and father of three, founded Childventures Early Learning Centre in 2002, which offers the best of Montessori, High Scope and Core Knowledge. Dr. Heidary and his wife sought out a daycare centre that would provide the best early learning education for their first-born. After visiting several daycare centres, Dr. Heidary realized there was not a centre that offered qualified educators, quality programs, and a curriculum designed to influence neurological development. Aware of the positive influence early childhood education has on a child’s development and the impressive long term returns resulting from the short-term investment, Dr. Heidary decided to build his own daycare centre which comprised of his list of requirements. Childventures’ highly trained staff of professionals partner with families to develop children to their fullest potential by encouraging the importance of moral values, promoting humanity and overall interest in the world. Creating a solid foundation for future learning, Childventures provides children with a stimulating environment that meets their emotional, social, intellectual and physical needs, overall, progressing development for lifetime. This entry was posted in Uncategorized and tagged child development, family, family time, kids, Kids, Parenting, quality time, social abilities on December 13, 2013 by Nancy. I completely agree with this idea and approach to gifts. Experiences are the absolute best gifts. What’s the point of opening up more clutter to put on a shelf? I love the idea your parents had to take Emily to a movie and dinner. It’s such a simple gift of time – and inexpensive. The best adventures come from just spending time with the ones you love. I think that children and adults everywhere should adopt the idea of giving experiences for Christmas and Birthdays. Our lives would be so much more enriched for it! I love this: “opening up more clutter to put on a shelf”! Well said.